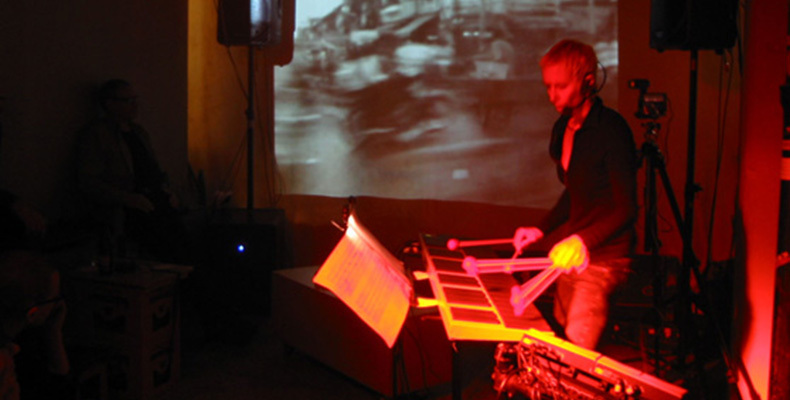 Amy Knoles is a composer/percussionist who has been composing and performing live electronic music for more than three decades. She has headlined on various festivals throughout the world. Among the electronic music devotees, she is probably best known as one of the gurus of electronic music. Electronic music is all about the hunger and desire to create new possibilities; and Amy has always been hungry. So she began experimenting with interactive computer music in 1979, while performing and recording the multimedia pieces of the “Grandfather of Techno” by composer Morton Subotnick. 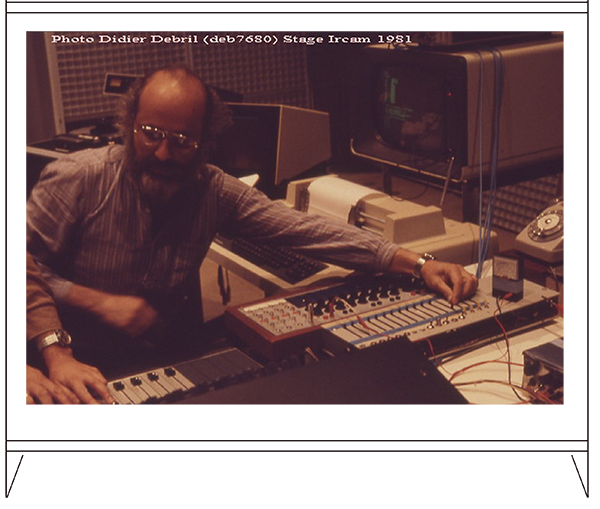 Later on she toured with Tod Machover, the head of M.I.T.’s Media lab and assisted his research on “human musical qualities” in translation to electronic instruments. She also created a notational system for the DrumKat percussion controller for the head of Media Labs at Brown University, Todd Winkler. Through several week long residencies at Arizona State University’s Institute for Studies in the Arts, she worked with composer Glenn Hackbarth on his piece for Mallet controller and the interactive music system MAX, and has also been in residence at Stanford University’s CCRMA, and University of San Diego’s CRCA, which are electronic music/interactive computer music research facilities. Amy has received major awards from Meet The Composer (2006), American Composers Forum (2005 & 2007 & 2009), Durfee Foundation (2003), UNESCO (2001), C.O.L.A. (2001), Lester Horton (2001), and was the 1996 ASCAP Foundation “Composer-in-Residence at the Music Center of Los Angeles”. She has been the Executive Director of the California E.A.R. Unit for thirty years, and has recently created the department of Electronic Percussion for CalArts. She has worked with the Los Angeles Philharmonic New Music Group, Kronos Quartet, Pierre Boulez, Ensemble Modern of Frankfurt, The Bang On A Can All Stars; and giant composers and musicians such as John Cage, Elliott Carter, Morton Feldman, Frank Zappa, Morton Subotnick, Steve Reich, Tod Machover, Flea, Quincy Jones, and many others. She has performed on various major festivals such as the Audio Art Festival (Krakow), Video Topics Festival (MAMC Strasbourg), Days of Macedonian Music (Skopje), Helsinki Festival, The Cyber Arts Festival, The Aspen Dance Festival, the Julliard Conservatory of Music, the Walt Disney Concert Hall, and Sacred Rhythm Festival (Bali / Kyoto) which initiated by the Sacred Bridge Foundation. Amy has also recorded over 30 CD’s of new music for Echograph, Sony Classics, Nonesuch, New Albion, New World, R.C.A., and too numerous to mention. As an artist who has been persistently doing what she love in a genre that may not offer fame and fortune as much as other popular ones do, she must have a lot of insights that we need to learn. As in electronic music, we have to stay hungry—and quite foolish—to open a new door of knowledge. LTTW: Electronic music has always been closely related to percussion right from its beginning; as a percussionist and composer/musician, how do you describe such an interrelationship? I don’t know about percussion and electronics being so related, but I do know that for me I never even thought of composing until I had electronics in my hands. I went to a rehearsal of Morton Subotnick’s opera “Hungers” and there was this MalletKat there (a sort of electronic xylophone), and immediately I realized that I could play any sound that I could imagine, if I had the chops to create it with samplers and synthesizers. It was the beginning for me of a journey that is still taking me in fascinating directions and to fascinating lands. 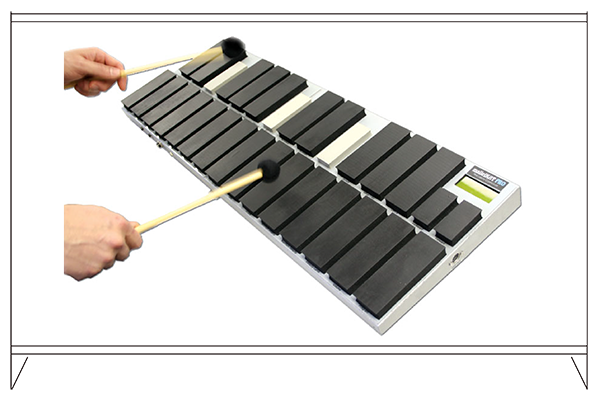 Speaking of performing, what makes this MalletKat so special to you? The first time that I struck a note I knew that it would be my instrument of choice. I could play any type of sound that I could imagine on it. I could play electric guitar, or samples of a child singing, sounds backwards then forwards, anything! Yes! I quite often samples of sounds found in the environment. Voices and machines. I just got some amazing field recordings when I was in India last week of the call to prayer while floating on a boat in the Kerala region called “Backwater”. The sound was echoing across the lake and was sung by a young boy. I plan to create a new piece with this material. So can I say your music is always a response to a certain context? You are known as an artist who often incorporates visual into your work; and I noticed that you have collaborated and toured with Butoh dancer Michael Sakamoto in recent times. Would you tell us what is it all about? And how do you two respond to each other? 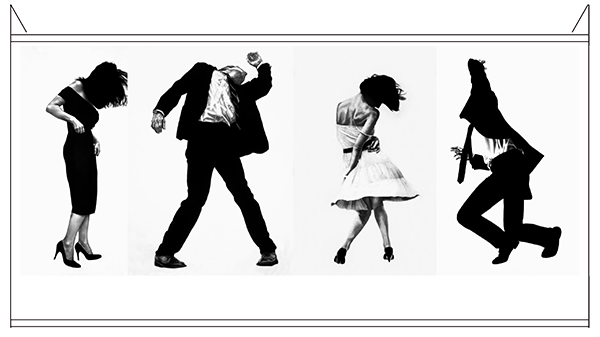 Michael came up with the basic idea that we look at sacred and profane forms of music and dance. We thought of Gagaku and the Blues (the “devil’s” music) Gypsy, Liturgical, etc, and worked with those forms. I created music for each “section” that could “move” with Michael in a somewhat improvisational way so that we could relate to one another on stage. Michael essentially improvises within each context. The costume was created to morph from one form to the next. Let’s talk about electronic music; what is electronic music to you anyway? I found my compositional voice thru electronics. I had never written a note until I had a Yamaha TX-81Z, an Akai S900 and Mac in my possession. Practicing for pieces that I commissioned, I decided to try my hand. My first real piece came from a mistake. I was programming a rhythm track on my MAC (a 512 at the time—1984) that was to trigger samples of the text “Men in the Cities”. I was creating a musical response to the series of drawings of the same name by Robert Longo at the Los Angeles County Museum of Art. The track was supposed to trigger words on on the S900 sampler but I send it down the wrong MIDI channel and it triggered pitched synthesizer sounds on my TX-81Z instead and “Men in the Cities” was born! Electronics have given me my music voice ever since. How do you think the young perceives and practices electronic music today? Well, I teach electronic percussion at California Institute of the Arts so I work a lot with young people in this genre and I see many different approaches. I find that the work that I do is well received by young people. Then how does the future of electronic music look like to you? Boundless! We are just getting started! You have been in music business for decades now, what kind of changes that you have seen in both the US and rest of the world? Are these changes more on the better side or worse? I’ve always occupied a strange little niche of the music world. The EAR Unit has been together for 28 years now performing and promoting the music of our time as a not-for-profit entity. We’ve began in residence at CalArts then the LA County Museum of Art for 17 years and now we are at REDCAT (in Disney Hall complex), in addition we’ve traveled the world and we have commissioned over 500 new works. We’ve never been able to completely support ourselves with the group but I’m not sure that we’d want to do only that anyway. Recently the group received a grant that will greatly help us not only financially but in terms of numbers of performances which will qualify us for other grants, a possible snow-ball effect if we are diligent. This came at a time where we were considering giving up. I’m seeing less opportunity for myself as a soloist in recent years as the Festivals that I have been participating in have lost funding and are being booted out of their spaces by conservative venues. These Festivals present work that is unpredictable and potentially off-putting to the more conservative audience and I think that it is easy for the governments to cry financial crisis to quash what they do not understand. Recently our government in LA tried to take away the % for the arts tax and cut the Department of Cultural Affairs in half. There was a protest and we are safe for now. It has always been a struggle and will always be a struggle for anyone who’s art is outside of the mainstream, but what a delight when we travel far and meet perhaps a small group of people that actually understand each other! You came to and performed in Indonesia twice; what kind of Indonesian music that you are familiar with? I studied and performed Balinese and Javanese Gamelan for 3 years at CalArts and loved every minute of it. The Javanese took me to a wonderfully peaceful place and the Balinese allowed me to use my percussive skills. A blast! I also commissioned 3 works for gamelan and my duo Basso Bongo that toured throughout the US. The pieces were by Rob Kyr, Evan Zipporin and I Nyoman Wenten. You teach at CalArts, compose music, and perform all over the world; is there a mission behind these activities? My mission has always been to keep the concert music of our time alive. To perform pieces by unknown composers and to create works of my own that mean something. Sometimes “meaning something” can just be making people laugh… or just being like an abstract work of art that let’s one find their own meaning. I have no rules and do not believe in “Style”! Lastly, you participated in three events that Sacred Bridge Foundation organized; would you do it again? In a heart beat! But I just flew back from India so no more long flights for at least a month!! Ha ha ha.. Thank you very much Amy for your time, your kindness in taking this interview, and most of all, your contribution to the world music. I am sure this will inspire many, especially young musicians like myself. Love the interview! she seems very critical in every point of discussion..Looking forward for EAR Unit newest release!